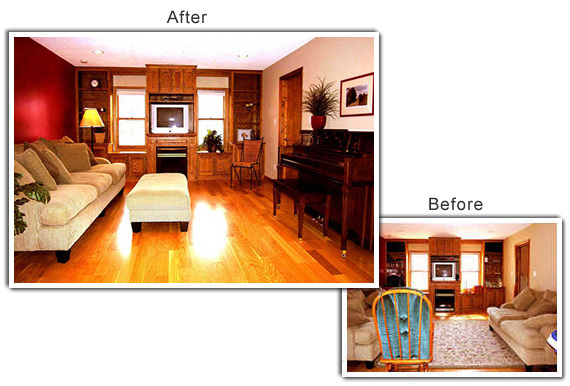 What works: Shiny wood floors, built-in cabinets and a fireplace. What doesn't: A bright red accent wall, inefficient furniture placement and too much clutter. The family room in this Mounds View home has bright red walls that take on too much attention, and too much furniture blocked views of built-in cabinets, a fireplace and the hardwood floors. "When all the positive features are hidden, the negatives tend to stand out even more," said Lori Matzke of Centerstagehome.com. Silk greenery in baskets next to the sofa softens the stark window, keeps the woodwork from feeling too overwhelming and helps draw your eyes around the room. A floor lamp in the corner helps balance the light throughout the room. Matzke positioned the sofa 8 inches from the wall to create a more concise layout; a matching ottoman adds dimension and makes all the space in the middle of the room feel like it's being sensibly used. This new layout draws attention to the focal points of the space. Matzke also removed the bright print that was over the sofa because it created too much contrast with the red wall. A baby jumper that was hanging from the ceiling was packed away, and clutter on the shelves was boxed up to give buyers a better view. Sellers should always remember that a few larger accessories will do a better job of showcasing cabinets, and leaving a few shelves empty makes the space feel larger. Removing the area rug helps show off the hardwood floors. A small blue-green rocking chair clashed with the red wall, so Matzke replaced it with a smaller outdoor chair that she set in the corner. Leaving the window blinds wide open lets more light into the room, flattering the shiny hardwood floors. A decorative silk palm in a red ceramic pot and a landscape photo in a red frame over the piano help balance the accent wall. An overstuffed loveseat was replaced with a piano that had been in the living room, in an attempt to create more space.